easyvision linarial daily disposable contact lenses give your eyes what they’re asking for—healthy breathable lenses that are so comfortable, you’ll hardly think about them at all. The lenses are manufactured using Smart Silicone chemistry which delivers a soft contact lens that strikes the right balance, so your eyes get plenty of oxygen (which they need), while you enjoy long-lasting comfort (which you want). When you wear lenses, the last thing you want is to be constantly reminded that you have them on your eyes. Essentially, you want to forget they’re there. This is easyvision linarial, they offer such comfort, they’re instantly forgettable. 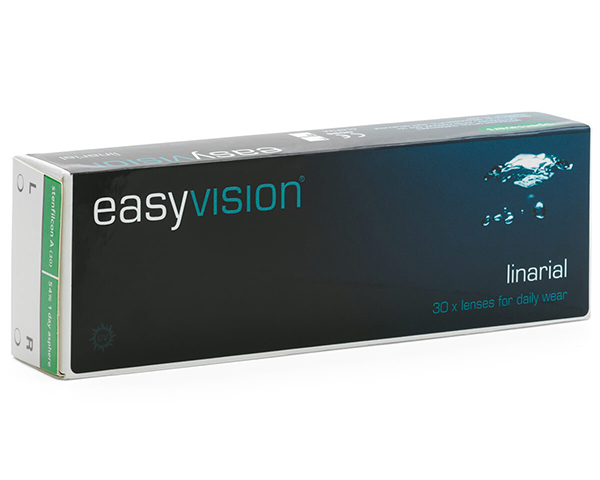 easyvision linarial lenses were designed with your health in mind. They are the result of years of research—finding the right combination of lens materials to help ensure your eyes get the oxygen they need, which keeps them healthier and whiter.